3 Things You Didn’t Know About Bananas: #2 is Scary! For most people, the biggest debate about bananas is if they should get peeled from the top or the bottom. Of course, there are also the great questions about just how ripe they should be for consumption. Do you like them just past green or brown, sweet, and almost mushy? Regardless of whether you are a top or a bottom in the great banana peeling debate, or if you prefer bananas starchy or sweet, there are plenty of things you probably didn’t know about the common ones that you may enjoy sliced in your cereal or blended into a smoothie. These include possible threats to the world banana supply. Big Mike bananas: Were bananas better back in the day? The kind of banana that is most commonly found in produce aisles of grocery stores is called a Cavendish. Developed in the 1830, the Cavendish banana didn’t really become popular until some time in the 1950s. Before that, a type of banana called Gros Michel, or Big Mike, was the main type of banana sold on the market. According to sources, banana extracts and flavorings actually taste more like this classic banana than the currently popular Cavendish. Where Did Gros Michel Bananas Go? If Gros Michel bananas tasted so good, why aren’t they still popular? Big Mike is not totally extinct, but Panama Disease, a fungus, attacked the supply in South America and Africa, and these two continents also exported heavily to North America and Europe. The Cavendish is resistant to this fungus, and it also has a longer shelf life and is easier to transport than Big Mike, but they may not taste quite as “banana-y” as the original. Gros Michel bananas are still grown in parts of Asia where the fungus is not a problem. 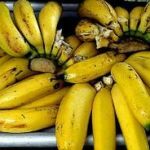 One thing that makes bananas vulnerable to disease is the fact that the seeds have been mostly cultivated out of them to make them more enjoyable. Plants are grafted to each other, and this reduces the genetic diversity in each plant, so it is unlikely that one banana plant is resistant to a fungus or other disease that attacks others of its kind. There is some reason for concern because even though Cavendish are resistant, but not invulnerable, to the fungus that attacked the Gros Michel banana, they are threatened by other fungi. This is a concern because there is not a commercially available replacement for the Cavendish as the Cavendish replaced Big Mike. In 2013, a disease called Black Sigatoka raised major concerns that the supply of Cavendish would be threatened, and plant specialists are working hard to produce hybrid varieties with more resistance. Hopefully, we will not all by singing Yes! We Have No Bananas! Actually, you may not be insulting a person when you say they are bananas. This versatile and tasty fruit is a nutritional goldmine, and some different varieties provide a critical source of starch in some parts of the world. They contain little fat, but they do give us vitamin B6, potassium, and fiber. At around 100 calories, bananas can be frozen for smoothies, eaten ripe as a portable snack, and provide just the right amount of sweetness and textures to sandwiches and desserts.